My aunt, Josie Keenan, was born Josephine O’Hanlon on 15th March, 1920, youngest in a family of 3 boys and 4 girls to Owen O’Hanlon and Emma McKnight. Her siblings were Danny, my father, Katie, Mick, Emma, Rosina and John and they all lived together in beautiful Clontigora close to Hagan’s Bridge. This idyllic start was soon disrupted as her mother, Emma, died while Josie was only two; a tragedy compounded by the death of her father, Owen, when she was four. There was no cohort of social workers to take control and the children may all have been destined for an orphanage but for a far-sighted Parish Priest who declared that the family should be preserved intact. Danny, then only 17, became the Man of the House and Katie, 16, the Mother. With a resilience that few today could achieve they survived and Josie grew up in a loving environment albeit without luxury. She attended the local Killian Primary School moving on, when the time came, to Our Lady’s and eventually to St Mary’s College in Belfast whereshe trained as a primary school teacher, a career choice which would be to the benefit of many children for the next 40 years. I heard just recently, living eye-witness accounts of a very tall chemist seen regularly cycling the route from the Dublin Road in Newry out to Clontigora. Oliver and Josie would often be seen “stepping out” around the roads from there to the Flagstaff and beyond in a procedure as old as the hills around them but, no doubt, inconceivably simple to current generations. They were a cultured young couple and I have seen their names on old programmes of both The Feis and Newpoint Players and Oliver often boasted to me of his on-stage achievements. It wouldn’t be the last marriage to come out of association in those organisations. bike secreted away in the area for the duration of her term there. This bike was crucial to many of her employments. Indeed, Norman Tebbit, many years later might well have based his “on yer bike, plenty of work if you look for it” speech on Josie’s approach to job-seeking. She told me of cycling from Clontigora to Ballyholland to teach. All this hill work must have given her beautifully crafted legs because in those days, before celebrity culture, with Holywood making inroads even as far as Clontigora, she was referred to locally as Heddy Lamar because of her beauty and, it’s a fair word to use, grace. In a family of brothers and sisters who, like Spinal Tap, had their amplification systems go all the way up to 11 instead of 10, she was the quiet, calm one who spoke with clarity and knowledge. Oliver and Josie got married on Easter Monday 1949, the day the Free State became a republic. We don’t know if the two events are associated but you could be pretty sure that Oliver had an opinion on the subject. The young couple set up their home above Oliver’s chemists dispensary in Hill St and soon moved to Erskine St. First born of this happy union was Maura, soon followed by Una then Tom and finally, Michael. By this stage the family had moved out to Derrybeg Villas apparently because Josie was a country girl at heart. All was perfect and, if we secretly called him Blessed Oliver Keenan, that is in fact what he was and Josie was devoted to him to her final day. By this time she was working in the school which was to be her major employment and her happiest time in teaching: St Joseph’s Primary. She made strong friendships with Lilian Donnelly, with whom she worked, and Agnes McConville with whom she had been to school. I have heard many testimonies of her time in St Joseph’s one going as far as to say “your Aunt Jo saved my life. I was in the depths of despair in school until she came along”. She was both gentle and genteel. The most appropriate term I heard to describe her came from one former P3 student: “she was serene”, which, as any teacher will tell you, is some going in classes of up to 40 in those times. Her classroom was an oasis of calm and knowledge. She dared to follow Oliver on to the golf course but in the course of many Keenan four-balls over the years was declared “a useless golfer”. Her pursuits were more intellectual: she was an avid reader; she had to the last an exceptional mind with a depth of knowledge; had memorised vast numbers of poems and was an avid crossword fan – to the end completing the daily Irish News crossword. Eventually the family moved into Patrick St, very convenient to the local church. 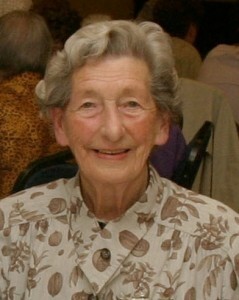 Josie was in every way the epitome of what we refer to in Newry as a “Dominican Catholic”. She was a devout believer and practitioner and most deserving of the term, The Faithful. The family are most indebted to Martin who brought Oliver and herself Communion every 1st Friday allowing then to continue in the practice of their faith. May I mention one other lady. It is indicative of the old-fashioned and proper way of the pair of them that Mrs Evans, her constant companion and source of support, was always “Mrs Evans”: a lovely indication of old values and the mutual respect they had for each other. And so the years passed. Maura went to Vancouver and on her many visits home would endure the gentle taunts to retire to Newry. I think Josie admired that spirit of independence. Una married Brian and have Josie and Oliver’s grandchildren, Claire and Mark. They must have paid more tolls on the M1 than any of us in their regular visits to mum and dad. Tom whose beautiful mind was sadly compromised in recent years, a cause of much heartbreak to her; Michael and Karen with the grandchildren Cheryll, Rory and Kim and, indeed, two great-grandchildren were a tireless source of care and support. Mary O’Hare was like a spare daughter to her and Gerard also. Any time I would come in she would stare blankly at me and say to all around her: “I don’t know this person. Who is it?” causing me great concern. The twinkle would come in the eye and she would say,”It’s so long since you came to see me I didn’t recognise you”. To all the care workers. Thanks are inadequate. They were independent and un-institutionalised because of your devotion. You are priceless. The Keenans and their children and extended O’Hanlon family kept watch and supported in so many ways for which the family express profound gratitude. Josie died as she lived, with grace and dignity and we are all diminished by her absence. My greatest memory is of her generosity to me as a young only child without a father and of how she and the entire Keenan clan embraced me, and of her intellect. That one small head could carry all she knew.